If an Oscar-bait movie falls in the limited release forest, does it make a sound on Netflix? Your guide to this question, but without the horribly tortured metaphors, is the mysterious Ron Swanson. If you work in the film industry, Beasts of No Nation is a pretty big deal – it’s the first production from one of the world’s most pre-eminent media companies, Netflix, and its success, or otherwise, will probably have an impact upon the distribution models of countless other films. If you don’t work in the film industry, and let’s face it, most people don’t; then it’s no more than just another film. When Netflix announced that they had purchased the rights the director Cary Fukunaga had just wowed the world with True Detective, and it seemed like a significant strike to move Netflix into uncharted waters. Fast forward a year later and nobody is wowed by True Detective any more and Beasts has arrived with little more than a whimper of curiosity from its festival bows and spectacularly poor box-office returns from the handful of theatres its played, and the film looks set to disappear from the public’s consciousness rather quicker than anyone could have imagined. One of the reasons it felt like Beasts would be significant was the fact it seemed like it could be an awards contender – on the back of Netflix and Amazon’s success at TV awards shows with the likes of House of Cards and Transparent, could Netflix now gatecrash the film world’s biggest nights and score Golden Globe or Oscar success? Right now, it doesn’t look good – no serious Oscar contender nowadays makes such an underwhelming impact at the box-office, and without the awards buzz, Beasts may begin to look like an expensive misfire for the company. It’s not that the film isn’t good per se – it’s more that it isn’t good enough. The film world has long been stuck in its ways – that’s why the majority of awards contenders are released in a two month period in the UK – everybody’s terrified of doing something different and having it blow-up in their face, so for a film to change that status quo, it needed to be a bona fide masterpiece and – as well acted and worthy as Beasts is – it just isn’t fresh, distinctive or powerful enough. 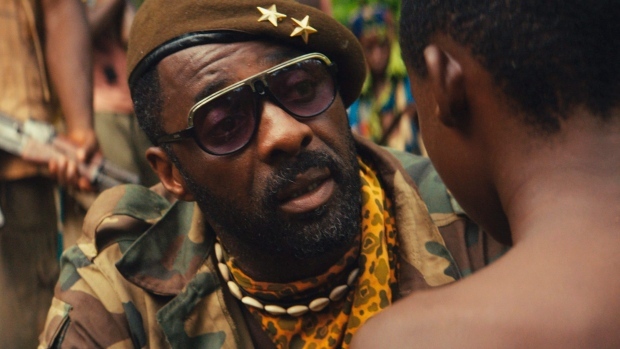 It’s the story of a child in an unnamed African country, who sees his father and older brother murdered in front of him, and after escaping the government forces that carried out that atrocity, he’s captured by the rebel forces, led by a charismatic but unhinged soldier, played by Idris Elba. His assimilation into the rebel army’s way of life is gruelling, but never feels different or truly shocking – maybe we’ve just become inured to films about the horrors going on elsewhere in the world. Beasts of No Nation, with a traditional theatrical model would probably still not have grossed enough money to force its way into awards consideration – it would have probably not have stuck around in cinemas long enough to make its mark in the collective mindset, and it certainly wouldn’t have earned enough money to pay back the investment any traditional distributor would have had to make to secure the rights. On the one hand, Netflix might be the best place for it – a place where it can be pushed to subscribers for a considerable amount of time – but you would have to think that Netflix themselves will be disappointed by the impact of their first foray into feature films. Their next highest-profile deal was the one with Adam Sandler which spans 6 (six) films – suggesting that the search for awards glory might not be the only motivation for their move into production. Whether or not spending such sums on their own film productions is going to be profitable will, I daresay, not be clear until long past that deal’s conclusion.